Ptolemy VIII Euergetes II[note 1] (Greek: Πτολεμαῖος Εὐεργέτης, Ptolemaĩos Euergétēs "Ptolemy the Benefactor"; c. 182 BC – June 26, 116 BC), nicknamed Physcon (Φύσκων "the Fat"), was a king of the Ptolemaic dynasty in Egypt. Ptolemy VIII's complicated political career started in 170 BC. This is when Antiochus IV Epiphanes of the Seleucid Empire invaded and captured King Ptolemy VI Philometor and all of Egypt, with the exception of the city of Alexandria. 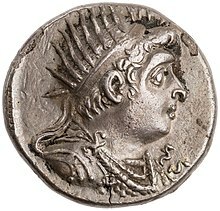 Antiochus allowed Ptolemy VI to continue as a puppet monarch. Meanwhile, the people of Alexandria chose Ptolemy Euergetes, his younger brother, as king. Euergetes was popularly known as "Physkōn", Latinized as Physcon, meaning potbelly, due to his obesity. Instead of taking up arms against one another, the brothers decided to co-rule Egypt. After Antiochus withdrew from the area in 168 BC due to threats from Rome, Physcon agreed to jointly rule Egypt in a triumvirate with Philometor and Cleopatra II of Egypt (Philometor's wife and their sister). This arrangement led to continuous intrigues, lasting until October 164 BC, when Philometor traveled to Rome to appear before the Senate, who were somewhat agreeable with the arrangement. However, areas under Physcon's sole rule were not satisfied with the arrangement, and in May 163 BC the two brothers agreed to an altering of the original partition. This left Physcon in charge of Cyrenaica. Although the arrangement lasted until Philometor's death in 145 BC, it did not end the power struggles. Physcon convinced the Roman Senate to back his claims on Cyprus, but Philometor opposed this. Physcon's attempt to conquer the island failed (161 BC) and the Senate sent Philometor's ambassadors home. In 156 or 155 BC, Philometor tried to have Physcon assassinated but failed. Physcon went to Rome, displaying the scars he had received in the attempt. Despite opposition from Cato the Elder (an ally of Philometor), he received the Senate's support and further resources for another attempt on Cyprus. During his time in Rome he met Cornelia Africana (who had been recently widowed following the death of her husband, Tiberius Sempronius Gracchus (consul 177 BC)), and asked for her hand in marriage, which she refused. The second attempt on Cyprus also failed. Philometor captured and held Physcon prisoner, but spared him; offering him instead the hand of his daughter, Cleopatra Thea, and sent them back to Cyrenaica. When Philometor died on a campaign in 145 BC, Cleopatra II quickly had her son Ptolemy VII proclaimed King. Physcon, however, returned from battle and proposed joint rule and marriage with Cleopatra II, both of which she accepted. He had the younger Ptolemy assassinated during the wedding feast and claimed the throne himself, as "Ptolemy Euergetes" (a name deliberately recalling his ancestor Ptolemy III Euergetes), and had himself proclaimed pharaoh in 144 BC. In 145 BC, Physcon took his revenge on the intellectuals of Alexandria who had opposed him, including Aristarchus of Samothrace and Apollodorus of Athens. He engaged in mass purges and expulsions, leaving Alexandria a changed city. "He expelled all intellectuals: philologists, philosophers, professors of geometry, musicians, painters, schoolteachers, physicians and others, with the result that these brought 'education to Greeks and barbarians elsewhere,' as mentioned by an author who may have been one of the king's victims" —Menecles of Barca. Physcon seduced and married Cleopatra III (his wife's daughter) without divorcing Cleopatra II, who became infuriated. Many speculate that Physcon only married Cleopatra II because he was plotting to marry Cleopatra III when she became of marrying age. By 132 or 131 BC, the people of Alexandria had rioted and set fire to the royal palace. Physcon, Cleopatra III, and their children escaped to Cyprus; while Cleopatra II had their twelve-year-old son, Ptolemy Memphites, acclaimed as king. Physcon was able to get hold of the boy, killed him, and sent the dismembered pieces back to Cleopatra. The ensuing civil war pitted Cleopatra's city of Alexandria against the rest of the country, who supported Physcon. Growing desperate, Cleopatra offered the throne of Egypt to the Seleucid king Demetrius II Nicator, but his forces could get no further than Pelusium. By 127 BC, Cleopatra fled to Syria. Alexandria held out for another year. After further political maneuvering, Cleopatra II did end up back in Egypt in 124 BC. A formal amnesty decree followed in 118 BC, but it was insufficient to improve the government's relationship with the whole country. The Romans were forced to intervene in Egypt 116 BC. About 124 BC, Physcon sent his second daughter by Cleopatra III, Tryphaena, to marry Antiochus VIII Philometor. Physcon died in 116 BC. He left the throne to Cleopatra III and one of her sons, whichever she preferred. She wished to have her younger son, Alexander, reign with her; but the people of Alexandria wanted her older son, Philometer Soter, the governor of Cyprus, to be her choice. She reluctantly complied, with Philometer Soter taking the name "Ptolemy IX" and ruling for a time at her side. In the 1983 TV mini-series The Cleopatras, Ptolemy VIII is portrayed by Richard Griffiths. ^ Note: an inscription records that Physcon had bequeathed Cyrenaica to Rome if he died childless, an act not mentioned by any literary source. ^ Christian Habicht, Hellenistic Athens and her Philosophers, David Magie Lecture, Citing FGrHist; 270; F 9 Princeton University Program in the History, Archaeology, and Religions of the Ancient World, 1988, p. 9.